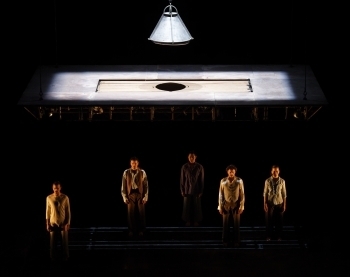 Marooned on a large platform that swings on chains in a cavernous sea of black space, five silent performers bounce off each other for 75 minutes as they experience the wild emotions of being confined in a small space. This is the latest work by Mathurin Bolze and his Compagnie MPTA. Part of the ongoing London Mime Festival, it's a simple piece of very physical theatre that feels pretty epic. The platform looks like a huge floating piece of escaped scaffolding. Above it hangs an enormous cow bell shaped light. The platform takes on the character of a reeling ship and the people become shipmates, sometimes working in unison, but other times smashing things into dust over each other's heads. Long planks spring up to stand vertical and bodies bounce off the springy lengths of wood. Bathed in blue and orange light, 'Du Goudron et des Plumes' has slapstick moments and elements of comedy, but overall the mood is dark. The piece is repetitive and the swinging platform has hypnotic qualities. The performers sweep beautifully across the space, swinging athletically from ropes, chains and off the edges and into the abyss. It feels as light as air at points, but then violent and aggressive. The stage is littered with debris by the end, the result of the performers’ destructive behaviour. Our favourite part was when large sheets of thick brown paper were lowered from the platform edges and lights behind made them burn orange. Wild black shadows moved behind the screen, throwing crazy shapes - both giant and tiny - across the paper. The sequence ended with sticks cutting jagged wounds into the paper and tearing it in pieces to the floor. It's hard to say what the story is. We were thinking it was all a little bit 'Lord of the Flies', but apparently it was inspired by Steinbeck's novella 'Of Mice and Men', though we have no idea why. It doesn't matter - this is a visual feast and is all about atmosphere and acrobatics. The story can be whatever you want it to be, if you need one at all. Du Goudron et des Plumes runs until 29th January as part of the London International Mime Festival, which ends this Sunday.